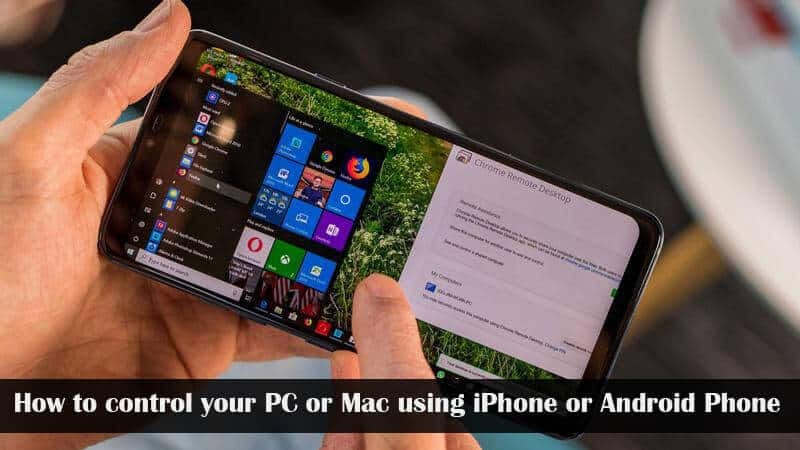 Follow us on this article if you want to control your PC or Mac using your iPhone or Android smartphone. Like we all know there are some places you can take your phone to but can’t take your PC with you. Do you also know that you can access any file or document from it? Note that you can do that only using Remote Desktop Connection feature. The remote connection feature uses the RDP (Remote Desktop Protocol). It gives users the ability to control or manage the host machine remotely on Their local network or over the internet. Below are the requirements needed to control your PC or Mac using your iPhone or Android smartphone. Ensure that you are using the latest version of Google Chrome on your host machine. Download and install the Chrome Remote Desktop app on your iPhone or Android smartphone. Make sure that Both the host and the remote device are connected to the internet. 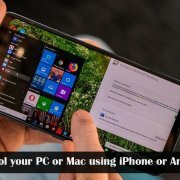 There are different methods that you can use to control your PC or Mac using iPhone or Android smartphone. In this article, we will explain the two best and easiest method you can use. Kindly follow the below guide step by step to get the logic. The first step in this method is to Open your app store on your Android or iOS (iPhone/iPad) device. The second step is to Download and install ‘Chrome Remote Desktop‘ app From your app store. Open the Google Chrome on your PC or Mac and download and install ‘Chrome Remote Desktop’ extension. Open the ‘Chrome Remote Desktop’ icon by clicking on it. Kindly tap on the ‘Get started‘ from ‘My Computers‘ section. The extension will automatically download a file. When the file has been successfully downloaded simply install it on your device. After the installation process is done, move back to the extension and click on ‘Enable Remote Connections‘ button. Having done that, Setup a new ‘PIN‘ for your connection and click on the ‘OK‘ key. Lastly, Authenticate the connection using the ‘PIN’ i.e PIN used in step 11. Open Google Chrome and visit the official remote desktop platform. You can simply click HERE to visit the site. Click on ‘Remote Access’ option, after that click on ‘Turn On‘ button to Begin the process. Select a new name for your computer. You can also use the existing one. Click on the ‘Start‘ button and Download the ‘Chrome Remote Desktop’ app from your respective app stores. Quickly install it on your device. Now, Open the app and tap on ‘Computer’ name. The last step is to enter the PIN to establish the connection.